Southern Illinois University Edwardsville’s Brianne Guilford, PhD, has been recognized with the Graduate School’s 2018-19 Vaughnie Lindsay New Investigator Award for significant research contributions to her field, respective school and department, and SIUE as a whole. Guilford is an assistant professor in the School of Education, Health and Human Behavior’s (SEHHB) Department of Applied Health and the exercise physiology graduate program director. Chancellor Randy Pembrook presented the award to her during a special reception held Wednesday, April 4 in the Morris University Center. Guilford will receive a combined $12,500 from the SIUE Graduate School and the SEHHB to be used in a one-year period. A talented and impactful scholar, Guilford exemplifies SIUE’s teacher-scholar approach by understanding the value of student participation in research. Stephen Hansen, PhD, faculty emeritus, established the Lindsay Research Professorship Endowment that funds the award in honor of Lindsay, who served as graduate dean from 1973-1986. Lindsay was responsible for creating much of the infrastructure that supports faculty research and scholarly activity at SIUE. Faculty and emeriti faculty at the time of the award’s conception donated the funds to endow the award. Those wishing to help support new investigators through the award may make a donation to the Graduate School section of the endowment at siue.edu/give/. 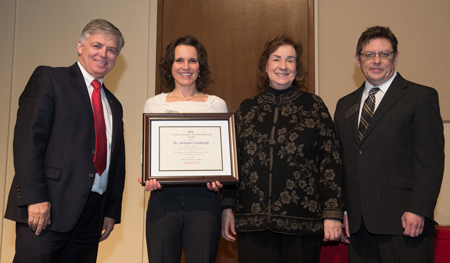 Photo: (L-R) SIUE Chancellor Randy Pembrook, 2018-19 Vaughnie Lindsay New Investigator Award recipient Dr. Brianne Guilford, Sandy Doreson, daughter of the late Dr. Vaughnie Lindsay, and Dr. Jerry Weinberg.